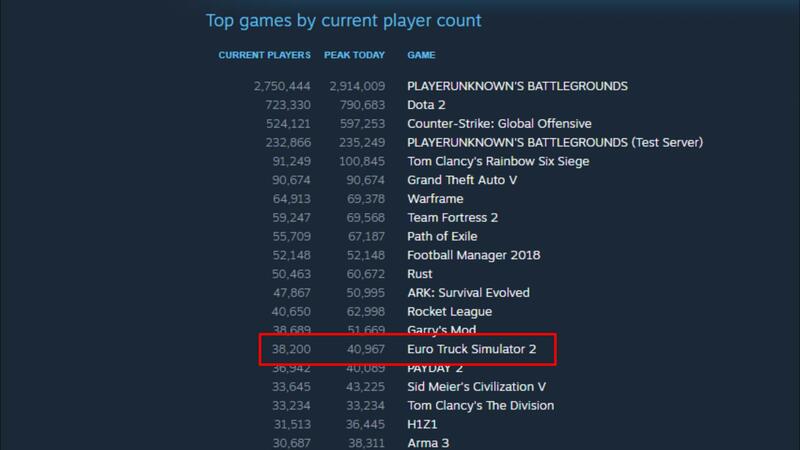 There is a good chance that you have never played Euro Truck Simulator 2. Simulators tend to be a niche genre that attract enthusiasts who have a vested interested in the realistic gameplay they offer. Aspiring pilots, for example, would likely purchase X-Plane 11 Global Flight Simulator, whereas the next Lewis Hamilton would steer towards rFactor2. Both of these games offer such realistic experiences that they are in fact used by professionals as a tool to hone their skills. It is worth noting, however, that in order to ‘get the most’ out of these ultra-realistic simulators, a sizable investment in hardware such as: purpose-built cockpits, realistic flight controls or steering setups, etc. is required. For Euro Truck Simulator 2 you could also go overboard and invest heavily in items such as those: an H-Gate shifter, VR headset, Fanatec steering setup; or you could just pick up a controller and have an absolute blast. While I stated that there is a may be a good chance you have never played Euro Truck Simulator 2, if you are the type of person that keeps your ‘finger on the pulse’ in the gaming world, then I highly doubt you have never heard of it. There is a reason this game (which originally released on January 16 2013) stays consistently near the top of the Steam Stats: it is just that good. Euro Truck Simulator 2 might not sound appealing at first glance — battling space aliens or dragons is the type of escapism that many are used to — but delivering a shipment of carrots from Aberdeen to Dresden? It sounds like a snooze-fest does it not? While everyone will likely have a different experience, as you would expect from subjectivity, the game has always been a cathartic experience for me. I thoroughly enjoy cruising the motorways of Europe, taking in the sights and listening to my local radio station in-game. But the game is so much more than just that. When you first start, you are a low-skilled nobody without a truck and have no other choice but to perform deliveries for haulage companies. Once you save up some money (or go straight to the bank and apply for a loan) however, you will be able to buy your first rig and rent your first yard. After this, you will be seeking contracts, upgrading your skills, buying more trucks, hiring drivers, pimping out your trucks, and eventually establish your own empire in the trucking world. Italia certainly adds some beautiful scenery to what was already a gorgeous game. But don’t just take my word for it, have a look at this in-game shot just outside of Pompeii; yes, that is the infamous Mount Vesuvius towering majestically in the background. Whilst the minimum PC requirements for this game are fairly conservative — Dual core CPU, 4GB Ram, GeForce GTS 450 or similar — the game really shines if you have a little more horsepower at your disposal. By no means do I have the ‘best of the best’ hardware at the moment, but my 4th Gen i7-4790K teamed up with an Nvidia GTX 1060 delivers a consistently smooth and visually stunning experience. While the base game is beautiful, fans of Euro Truck Simulator 2 have been relatively spoiled by the two previous major DLCs: Vive la France! and Scandinavia, which both added some fantastic graphical assets as well as region-specific industries (we also had a smaller add-on titled Going East, which added Poland, Czech Republic, Slovakia, and Hungary quite some time ago). So, admittedly, I wondered whether the Italia DLC would just be the case of a new peninsula with the addition of road signs written in Italian for a change. 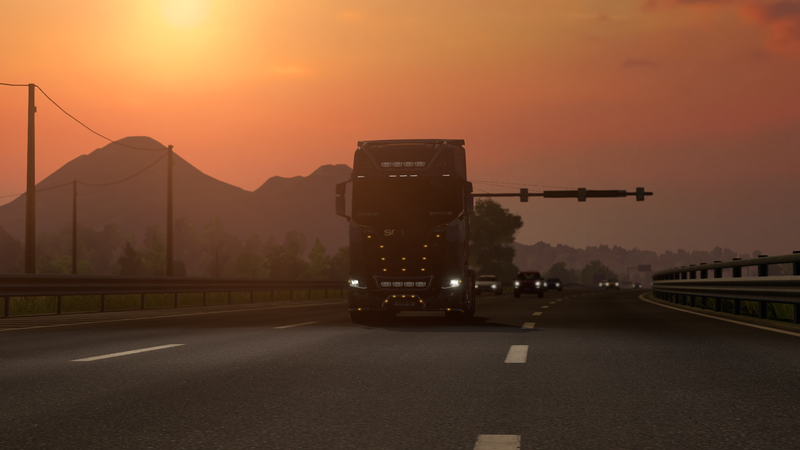 I fired up the game and traveled to Milano (this Northern Italian city was already in the game prior to this DLC) so I could purchase a brand new Scania S-Series truck for my Italian adventure. 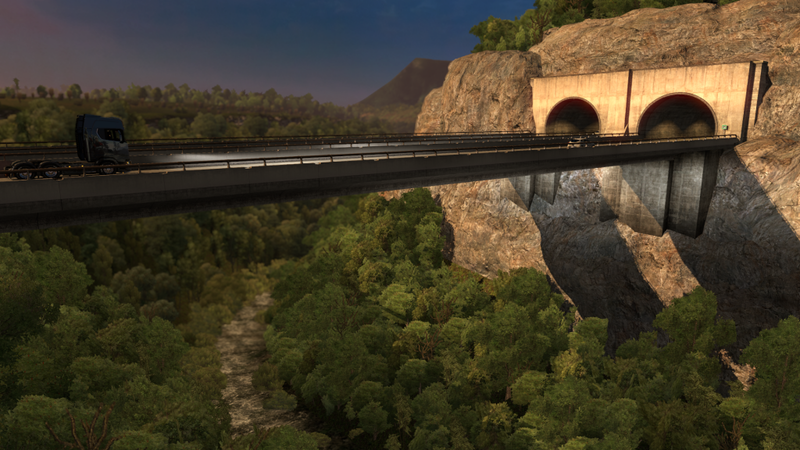 Upon entering the Italian countryside, it became apparent that once again SCS Software has delivered another top-notch DLC with some of the most stunning vistas I have seen in a driving game. The Autostrade per I’Italia is in pristine condition, enabling your rig to really ‘stretch it’s legs’ and reach a nice comfortable cruising speed. The only down-side to the Autostrada is of course that they are toll roads, so make sure you have some spare cash to pay your way. Now, you could avoid these toll roads altogether and enjoy the more rural routes, but I would urge caution if you are hauling a large load such as any of those featured from the Heavy Cargo Pack, as the back roads can be fairly narrow. Navigating through some of the smaller cities can also be problematic with a large load, but despite these logistical headaches, the environments are beautiful and feature the glorious architecture that Italy is renowned for. Given that I wanted to explore as much as I could for my initial exploration of Italy, I opted to not haul anything. This also allowed me to put the pedal to the metal and not have to worry about the limiting factors that a trailer would have on my speed or turning radius. Exploring the roads leading through the Apennines was an exhilarating drive for me, alternating between tunnels and bridges — with views like the one above — and plenty of curvy segments to make sure I was paying attention to my surroundings. I was pleasantly surprised to see the occasional Lamborghini fly past me, a nice little addition for us car aficionados. Of course I had to watch my own speed, as the Arma dei Carabinieri were consistently patrolling the roads. After just driving with no real destination in mind, I decided to start seeking out some of the sights that the Italia DLC contains. I drove down to the Carrara Marble Quarry in Tuscany, which is represented exceptionally well within the game. With a quarry this large it is no surprise that Italy is renowned for their marble work! I could have picked up a delivery here, but decided to just continue with my random exploration of the peninsula. Due to the unique geography and shape of Italy, the country has a comparatively high concentration of cities when compared to other European destinations within the game. This allows for a varied selection of origin points and destinations for deliveries, which I wholeheartedly look forward to take care of. But that will come later, for now I just wanted to go sight-seeing. 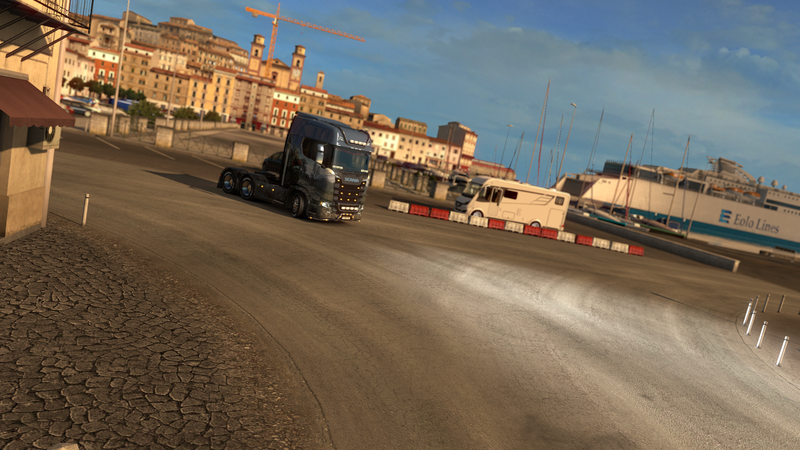 So I pointed my 730 horsepower big rig towards Napoli (aka Naples), ensuring to visit Rome on the way. While the scenic countryside had previously taken my breath away, I was absolutely gob-smacked by the architecture in the game. Though I have not explored much of Italy in person, I did visit Vicenza many years ago, so I am relatively familiar with the typical piazzas and renaissance inspired buildings. The Italia DLC has these aspects in bucket-loads, truly delivering an authentic feel to the exploration of Italy. The only downside to cruising through these beautiful cities was that I found myself wanting to park the truck and get out! I would have loved to stroll up to one of the cafes and order an authentic cappuccino, but then I remembered this was just a game an immersive simulation. Honestly, due to how realistic everything appeared, and how completely immersed I was within these environments, Italia quickly affirms that this is a simulator and not ‘just a game’. I have a close friend that has invested heavily in various simulators, and he is fortunate enough to own a Vive, which is supported by Euro Truck Simulator 2. He attests that the experience is truly phenomenal when teamed up with a quality force-feedback steering wheel, to say that I am slightly envious would be an understatement. Despite my hardware envy, the game is still thoroughly enjoyable regardless of how you play it. I personally use a controller, as this allows me to get nice and comfortable in my chair whilst soaking in the sights via my #BattleStation. I highly recommend playing via the driver’s view from the cab, as this gives the most authentic experience, but with a plethora of different camera views you can, of course, choose external points of view for tricky maneuvers (especially when you are reversing a delivery into position). Controller in hand, my next destination was to venture down to the island of Sicily. This involved moving on from Naples, passing by Catanzaro and hopping on a short ferry ride from Villa San Giovanni (another beautiful area) over to Messina. Once again I was treated to fabulous vistas, and plenty of narrow intricate streets throughout this wonder city. With thousands of miles to drive and countless hours of playtime thanks to all of the new possibilities that Italia offers, this is, in my opinion, the best DLC that SCS Software has released yet for Euro Truck Simulator 2. While I personally feel that the price of this expansion is an absolute bargain, I can appreciate that value is a subjective matter, so if you are not a fan of the franchise then it might not seem as a steal. Not to worry though, the game is well-known for offering fantastic discounts as well as bundles from time to time on the Steam Store, so if you want to bide your time and wait until there is an offer, that is fair enough. However, if you thoroughly enjoyed the core game, or the account of my journey through Italia has piqued your interest, then this DLC is a must-buy. I have barely touched the surface of it yet, as there is plenty more for me to explore, but the hype train at SCS Software just refuses to come to a halt. 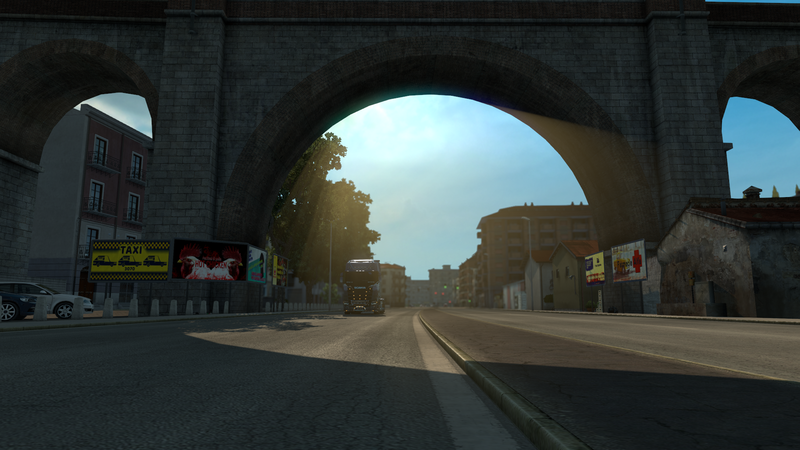 Euro Truck Simulator 2 – Italia delivers a visually breathtaking experience, and delivers a polished addition to the game. Overall, it is a high quality DLC that is well worth the asking price. 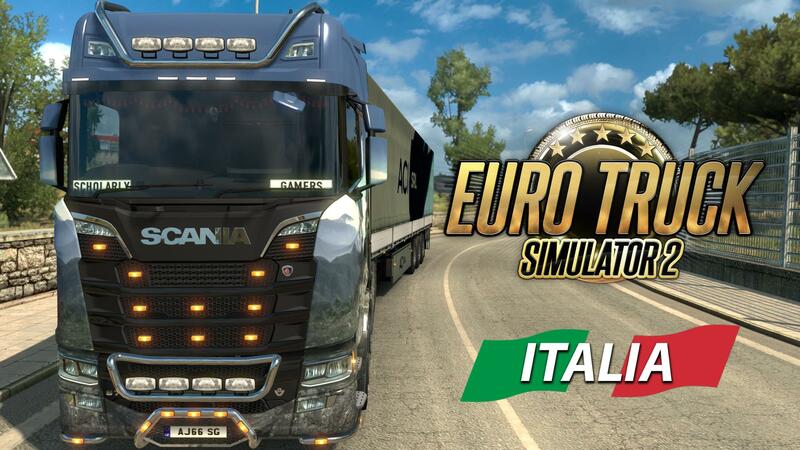 The Italia DLC for Euro-Truck Simulator 2 was purchased by the reviewer.